Special Containment Procedures: SCP-1622 is to be contained in a standard biological containment unit located in Site-77. Personnel observing SCP-1622 are to note its rate of consumption and any other notable or unusual behavior. Description: SCP-1622 is a specimen of Citrus × sinensis (sweet orange), originating from Lakeland, FL. It is a navel orange, with a small protrusion at one of its ends. 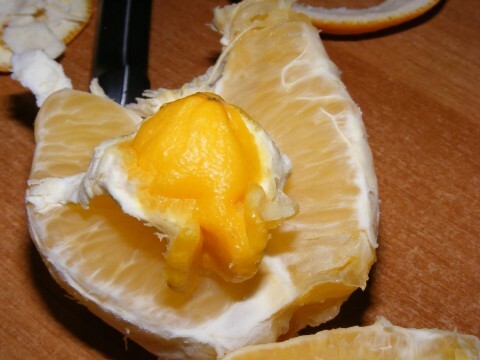 SCP-1622 appears to continuously consume its own body through its non-navel apex, while the other end produces new matter. It will consume itself in small, irregular amounts, and not in a continuous motion. For the record, the reason I failed to respond to his requests was that I didn't feel it was worth responding to. It's not really something you would take seriously, because this thing is ridiculous. Malkuth is a made-up word, and the extra bits at the end aren't comprehensible. On ██/██/2███, Researcher Franklin accidentally introduced foreign matter to SCP-1622's cavity in the form of a wooden pencil, resulting in the mass being added to SCP-1622's repeated cycle, which warrants additional containment procedures and amendments to the SCP-1622 containment doctrine. This request is submitted for approval. Due to the lack of additional funding or clearance to amend the containment doctrine, several researchers attempted to forcefully extract the foreign matter from SCP-1622. This caused injuries to two of the researchers, with one set of injuries being serious enough to warrant medical leave, and minor damage to the containment area. Disciplinary action is currently under consideration. On ██/██/2███, Researcher Hutchins attempted to forcefully enter the SCP-1622 research area, and was subdued by security personnel. Proper forms for disciplinary action have been forwarded to the director by project lead Researcher Milton. It is believed that Hutchins was attempting to alter the containment doctrines regarding SCP-1622, which Researcher Milton had already explained to be sufficient. On ██/██/2███, when the research team enacted a second attempt to remove the foreign matter from SCP-1622 resulted in SCP-1622 manifesting additional anomalous effects. It began to add large portions of the containment area and research staff to its cycle, and directly causing the breaching of ██ separately contained E-Class objects and 4 SCP objects. Security teams were able to contain the event, but SCP-1622 requires massive update to containment. Upgrade to Keter Gevurah(Dangerous/High) is currently pending. Researchers Milton and Hutchins have been placed on indefinite leave, pending severe disciplinary action. Committees have been formed to study the issues these incidents present to the current structure of Site-77's chain of command, research database, containment areas, and the psychological status of prominent researchers. Containment doctrines of SCP-1622 have been slated for complete revision.